It’s not often that one begins their series of farm visits by viewing a National Champion. This is how my tour began when I was invited to meet Alistair Leslie, of Blue Moon Arabians and see his mare, LALIQUE DS, who was the 1999 British National Supreme Overall Ridden Champion. Since acquiring his first Arabian horse just seven years ago, Alistair could be considered a new comer who has achieved remarkable success. Alistair, a soft-spoken man, beamed with pride when showing me Lalique. I viewed Lalique at Bourningwood Stud, her training stable in Essex, where she was turned out to display her natural movement and flair. She is a flashy, snorty, gorgeous mare of refinement as well as substance. This beautiful eleven year old mare was bred by D. Straz of the U.S., was later purchased by Paolo Gucci and then brought to the U.K. It was in November of 1998 that Alistair purchased Lalique. He had seen her before at Towerlands and had fallen in love with her. She was then owned by a man whose wife adored Lalique. Sadly, however, his wife unexpectedly passed away. As fate would have it, Alistair and Lalique were united on the promise to the man to have Lalique shown to her full potential. And Alistair, a man of his word, has done just that. Ridden and trained by the talented Hayley Budge, Lalique became British National Supreme Overall Ridden Champion at the 1999 British Nationals. 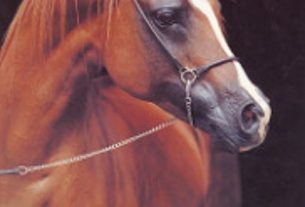 At the British Nationals in 2000, Lalique was shown in hand by Emma Maxwell, where she achieved Reserve Champion in her class, then in the Championship class she took Reserve Champion Senior Mare. 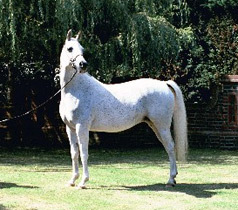 Lalique, a 1989 daughter of Menes RASB 309619 out of La Salone Ltd 305988 (*Salone x Bint La Quinta by *Bask x *Serafix daughter) is a typy mare of 15 hands. She is a compliment to anyone’s stable on her sheer beauty alone, however, her career as a show horse is remarkable. Prior to my departure from England, she went on to win the Ridden Mare Championship at the International Show (Towerlands). Just a month later on September 10, she won the Overall Ridden Championship at Hartpury Agricultural Show, the so called British Arabian Championship show , where she scored 20 in ridden and 20 in conformation. It is interesting to note that Lalique’s tail female lines trace to the Kellogg Ranch, in particular the mare Rossana, purchased by W.K. Kellogg from Lady Wentworth in 1926. 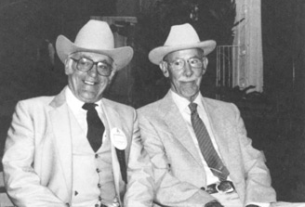 Rossana became Mr. Kellogg’s personal riding mare. Alistair informs me that Lalique is now doing well in the dressage ring. 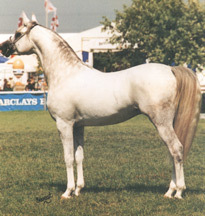 Alistair stands the 1994 gray Zircon Nazeer son (pictured top of page as the header/article photo), MEZZIAH, out of Minuette (Silver Scenario by Tornado x Mishna, an Indian Magic and Grojec granddaughter). I first saw Mezziah at the Towerlands show. 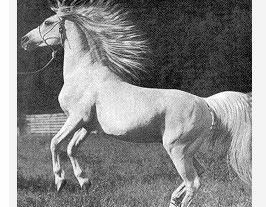 He is a correct, smooth bodied, almost white stallion and his movement is superb. His show career includes Champion 3 year old Colt at the AHS Malvern, Reserve British National Champion AHS Malvern, Silver Medal U.K.I.A.H.S. Towerlands, Supreme Champion Kent County Show, Champion Male H.O.C.O.N. A.H.S. and First at the Royal Norfolk Supreme. I also viewed two full siblings by Mezziah out of Krishenda (Donax x Mitsita by Silver Scenario); a two-year-old grey look-alike son, Kaziah, and a gorgeous liver chestnut filly foal at foot, Kamira, both owned by Christine Blyth. Christine also showed me a Zircon Nazeer colt at foot out of the Krishenda’s daughter, Kacia. I have to admit, the liver chestnut Mezziah filly was prettier and is one to watch in the future. It would seem that Mezziah is prepotent as a sire. However, for Mezziah, his disadvantage at stud is that his own sire is still quite popular, and they both stand at the same facility. There were also other horses owned by Blue Moon Arabians, but I was unable to view as they are stabled separately. These included the chestnut mare SPRING KANTATA (by Normativ, a Russian racing stallion, and out of Sunlea Kaprina) who won the Female Championship at the Royal 2000 and was second at the British Nationals in her halter division; SOMARA is a gray mare by Zircon Nazeer out of Somrah, (Somrah was a mare of pure Courthouse breeding bred by Joanna Maxwell and cousin of the only English World Champion, Siwah). And lastly, the 1999 gray filly, ALATIV, also by Normativ out of Aloysia, a mare of Crabbet/OE and Egyptian breeding. **Editor Note from Georgia Cheer: Alistair Leslie has informed me March 5, 2002, that Mezziah has been sold.